This is my call to action for the middle and high school students out there: it’s up to you to revitalize the economy. And the way to do this is through entrepreneurship. Entrepreneurship has been shown to drive innovation, productivity, and job creation that develops and sustains social progress and economic growth. Carl Schramm of the Kauffman Foundation argues, “Historically through the last seven recessions it’s been entrepreneurs who essentially restarted the economy.” Entrepreneurship drives economies, where countries with higher GDP per capita tend to have a higher entry rate of new businesses, as shown below. 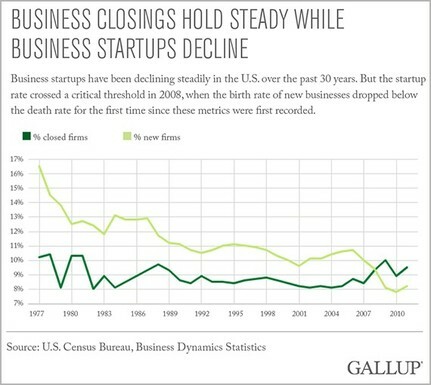 Unfortunately, the rate of entrepreneurial activity in the United States has been significantly declining over the last several decades, with the rate of new firm development crossing below that of firm closures for the first time in history just a few years ago. More firms are closing than being started, limiting the economic future of the country. The economy needs a pipeline of new companies and employees with increased innovation and adaptability. These skills and mindset are more prevalent in younger students, and are often diminished over time. Many studies show the higher propensity of young students toward curiosity and creativity, showing that distinct types of free play are associated with higher creativity in early childhood. Creativity, then, has a positive link to startup activity. Meanwhile, students have a variety of learning styles that are not fully being explored in today’s education system, leaving students with a large gap to overcome when entering the workforce. In particular, many students need more than just the lecture-based frameworks to learn, but instead need practical application beyond the classroom. Students want to put their ideas into practice in the real world versus just in the classroom, needing a productive outlet for their ambition and creativity. This need is becoming apparent through the countless new initiatives of hackathons and maker spaces. A recent NFIB Young Entrepreneur Foundation survey found that 90% of teachers and guidance counselors said their students were interested in becoming entrepreneurs, but 75% of the students didn’t know where to start. Furthermore, a 2014 Gallup poll reports that 42% of students want to start a company and 38% want to invent something that changes the world. Since entrepreneurship drives economic growth, students can drive economic impact earlier in their careers if get started in entrepreneurship earlier in life. While many students assume they need more of a resume or rolodex before starting a company, the best preparation for startup success is startup experience. Repeat founders create more valuable companies, and younger founding teams perform more successfully on average. The time is now! So get started at https://mitlaunch.com.